The problem facing the orthopedist in unicompartmental arthritis is addressing single-compartment articular cartilage wear and biomechanical overload while preserving the integrity of the remaining knee joint. Conservative measures, including bracing, weight loss, physical therapy, and injection, may provide temporary relief, often delaying the need for surgical intervention. Surgical options include arthroscopy, joint debridement, microfracture, osteotomy alone, or cartilage replacement in conjunction with osteotomy. Depending upon the severity of articular cartilage damage and joint deformity, one or more of these measures may ameliorate symptoms such that no further intervention is required. In cases of recurrent pain, a unicompartmental or conventional total joint arthroplasty may be undertaken. [2, 3, 4, 5, 6, 7, 8, 9, 10, 11, 12] See the surgical images below. 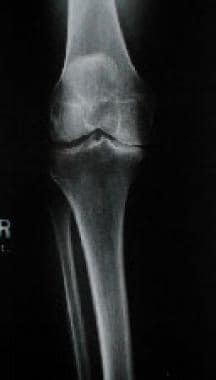 Postoperative anteroposterior radiograph of varus knee that underwent a closing wedge high tibial osteotomy with internal fixation. Immediate postoperative radiograph of a medial unicompartmental knee arthroplasty for a varus knee. Total knee arthroplasty for medial compartment osteoarthritis. Viscosupplementation in association with the appropriate cytokine environment is being studied to determine whether articular cartilage chondrocytes can be reactivated and programmed to regenerate in order to cover defects within the knee joint. Genetic tests are being identified to determine whether patients have an inherited predisposition to osteoarthritis, with the ultimate goal being genetic engineering to eliminate arthritis with gene therapy. Controversies abound among orthopedists regarding which osteotomy to perform and whether UKA is an acceptable alternative to TKA. Ultimately, patient selection and the surgeon's knowledge and skill level determine successful outcomes in the treatment of medial compartment osteoarthritis. With removal of approximately one third of the meniscus, increased force is transferred directly to the tibial articular surface. The joint also becomes less congruent and is not able to disperse the force across the joint. Both of these factors increase contact stresses, which can lead to articular cartilage damage and subsequent osteoarthritis. Results from multiple laboratory studies have shown that abnormal alignment also leads to abnormal contact stress. Ogata et al,  Wu et al,  and Reimann  performed similar studies in which a varus stress was placed across the knee, and each study documented degeneration of the articular cartilage in the medial compartment. The injury to the articular cartilage occurs in the deeper layers without any surface evidence of injury. Fractures of the tibial shaft and plateau may lead to subsequent lower extremity malalignment. Most clinicians accept less than 10° of angulation in tibial shaft fractures. For instance, residual varus angulation increases contact stresses across the medial compartment of the knee. 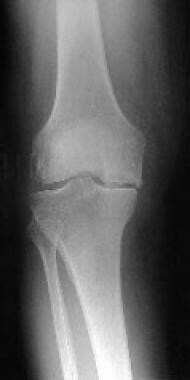 Tibial plateau fractures also may lead to medial compartment osteoarthritis. The arthritis in this instance is due to direct articular cartilage damage caused by the intra-articular fracture. Anterior cruciate and lateral collateral ligamentous laxity or incompetence have been implicated as causes of medial compartment osteoarthrosis. Anterior cruciate ligament (ACL) deficiency allows for anterior subluxation of the tibia on the femur, which leads to increased shear force upon the articular cartilage and, ultimately, to early degeneration of the articular surface. Torsion deformities of the tibia and femur have a clinical association with the onset of medial compartment degenerative changes. The torsion may be present on the tibial or femoral side of the knee. This may lead to varus angulation and increased contact stresses across the articular cartilage of the medial joint space, which leads to accelerated medial compartment osteoarthritis. Patients generally present with a chief symptom of pain in the knee that has worsened over time. Most patients report that the knee feels worse in the morning when they awaken and that the knee pain lessens with some activity. As their activity increases during the day, so does their pain. Anti-inflammatory drugs may help alleviate the pain. Patients frequently describe pain on the inside (genu varum) or outside (genu valgum) of the knee if unicompartmental arthritis is the cause of their symptoms. It is important to ascertain whether trauma to the knee has occurred, indicating an old history of fracture, articular damage, and/or ligamentous injury and malalignment. The presence of pain in other joints may alert the physician to an inflammatory arthritis or bilateral lower extremity malalignment. Physical examination may reveal varus or valgus alignment of the knee. Pain over the medial joint line may indicate a meniscus tear or degenerative changes within the medial compartment. Patellar tendon tenderness also may indicate medial joint degeneration, as well as possible patellar tendon pathology. Crepitus may be apparent in the knee. Range of motion (ROM) of the affected knee may be decreased compared with the opposite side. Fixed flexion contractures are uncommon but may occur in patients with tibiofemoral osteoarthritis. Evaluation of ligamentous stability is important. The integrity of the cruciate ligaments and collateral ligamentous stability may determine the feasible treatment options. In patients with varus or valgus alignment of the knee, determining whether the misalignment can be passively corrected to neutral is of key importance. Again, this aids in determining the surgical options for treatment of medial compartment disease. A complete blood count and routine blood chemistries are indicated. An elevated erythrocyte sedimentation rate (ESR) or elevated calcium or phosphate levels may indicate an inflammatory or metabolic etiology of the arthritis. These entities should be excluded prior to undertaking treatment for the medial compartment osteoarthritis. Obtain anteroposterior (AP), lateral, and sunrise views of the knee. An additional posteroanterior (PA) view with both knees bent to 45° (Rosenberg view) can provide a great deal of information regarding joint space narrowing. These radiographs enable the surgeon to determine the presence and location of arthritis in the knee. Stress views of the knee also may be helpful. Application of a varus or valgus stress may unmask, joint narrowing in the opposite compartment may be unmasked. This finding may alter the choice of surgical procedure. Alternatively, single-leg standing long-leg radiographs (hip to ankle) may be obtained. Obtain the hip/knee/ankle or 3-joint standing radiograph during the preoperative period. The radiograph must be taken with the leg in neutral rotation and with the legs bearing equal weight. Alternatively, the radiograph may be obtained with only the affected limb bearing weight. The mechanical axis may be measured from the 3-joint radiograph. A line from the center of the femoral head to the center of the talus forms the mechanical axis. This line should pass through the center or just lateral to the center of the tibial spines. In a varus-aligned limb, the line passes well medial to the knee. The measure of the dysplasia of the medial or lateral condyle of the distal femur also is important. The angle is formed by the intersection of a line passed through the femoral condyles and the long axis of the femur. The angle ranges from 80-85° and is larger in varus knees. Also measure the angle formed by a line drawn across the tibial plateau and the long axis of the tibia. This indicates metaphyseal bowing and usually is 0-3° varus. The metaphyseal bowing offsets the slight mechanical varus angulation at the knee to provide a joint line that is horizontal to the floor. MRI also may be considered to evaluate the ligamentous structures of the knee. However, ligamentous stability should be determined by physical examination. Arthrocentesis has a minimal role in the diagnosis of medial compartment osteoarthritis but it aids in differentiating a septic joint from a joint affected by gout or pseudogout. In addition, arthrocentesis may be used to relieve symptoms in patients with tense, painful joint effusions or hemarthrosis. Fluid aspirated from the knee may be sent for cell count, crystals, glucose, protein, Gram stain, and culture. In cases of trauma, the blood aspirated can be examined for fat droplets indicative of an occult fracture. NSAIDs are a mainstay in the treatment of medial compartment osteoarthritis. Myriad NSAIDs are available currently. The original cyclooxygenase (COX) inhibitors are nonspecific and inhibit both COX-1 and COX-2 enzymes. COX-1 is an important physiologic producer of prostaglandins. These prostaglandins fulfill many vital roles in the body. One such vital role is the production of gastric mucus. When gastric mucus production decreases, the incidence of gastritis and ulcerations greatly increases. Consequently, not all patients are able to tolerate these drugs. Gastrointestinal (GI) bleeding in patients taking NSAIDs has led to hospitalization and even death. COX-2 is essentially a pathologic enzyme. In osteoarthritis, the COX-2 enzyme is up-regulated, increasing the production of prostaglandins. These prostaglandins lead to the inflammation and pain present in arthritic knees. Selective COX-2 inhibitors target these pathologic enzymes, while allowing the physiologic COX-1 enzymes to provide their needed functions. Although the incidence of GI bleeding is significantly lower with COX-2 inhibitors than with nonspecific COX inhibitors, COX-2 inhibitors have demonstrated serious side effects, especially myocardial events and stroke. Two COX-2 inhibitors, rofecoxib (Vioxx) and valdecoxib (Bextra) were withdrawn from the US market for that reason. The remaining COX-2 inhibitor on the US market, celecoxib (Celebrex) is indicated for relief of the symptoms of osteoarthritis and rheumatoid arthritis, as well as to reduce the number of adenomatous colorectal polyps in patients with familial adenomatous polyposis (FAP). The drug is indicated in adults only. The recommended dosing regimen is 100 mg bid or 200 mg qd for osteoarthritis. The dose may be increased to 200 mg bid for rheumatoid arthritis. Absolute contraindications include hypersensitivity to celecoxib or sulfonamides. Celecoxib should not be given to patients who have had allergic reactions to other NSAIDs or aspirin. Although sometimes underestimated by both physician and patient, physical therapy plays an especially important role in the initial management of osteoarthritis of the knee. Patients can learn early that stretching, strengthening, and range-of-motion (ROM) activities help them throughout the course of their disease. Physical therapy also may help teach the patient about pain management activities that can be performed on a daily basis to improve the patient's overall condition. Also, physical therapy may help maintain ROM of the knee and decrease the incidence of fixed flexion contractures. These contractures can have a profound effect on the patient's lifestyle and may exclude patients from meeting the surgical requirements for certain procedures. Absence of flexion contractures makes the surgeon's job much easier at the time of surgery, regardless of the surgical procedure undertaken. Contraindications to the use of hylan G-F 20 are known hypersensitivity to hylans and active knee joint infections or infections of the skin at the injection site. Acute postinjection flares may occur. These may mimic an acute septic joint but are treated with ice, rest, analgesics, and observation. The treating physician must be aware of this potential adverse effect and not mistakenly recommend surgical intervention, as would be necessary in the case of a septic knee. Viscosupplementation has not been studied in isolated medial compartment osteoarthritis. Also worth mentioning are glucosamine and chondroitin sulfates. Anecdotally, many patients and physicians report excellent results with this oral supplementation, and these drugs have been used for the last 5-10 years in Europe with reported success. Trials comparing glucosamine and chondroitin sulfates to ibuprofen and placebo have substantiated their effectiveness. In addition, a recent report indicated an improvement in radiographic joint space in patients using glucosamine and chondroitin sulfates. Ideal dosages, side effects, and effects on in vivo human articular cartilage are as of yet unknown. Valgus unloading braces can reduce pain and improve function in patients with medial compartment osteoarthritis of the knee. Their use may slow the course of the disease by altering the biomechanics of the knee. Use of the valgus unloading brace in association with traditional medical treatment may be even more beneficial. Surgical intervention is indicated when conservative therapies have failed. Surgical options for isolated medial compartment osteoarthritis of the knee include arthroscopy, osteotomy, and arthroplasty. Knee arthroscopy may be used as a diagnostic procedure to help determine definitive treatment. As a therapeutic procedure, it may be used in cases in which nonoperative treatment has been unsuccessful but the patient requests the most minimal surgical option. Osteochondral allografts have been used for large osteochondral defects caused by trauma, osteochondritis desiccans, osteonecrosis, osteoarthritis, and locally aggressive benign bone tumors. These procedures are technically demanding and are performed at specialized centers. Patient selection is of paramount importance. Knee arthroscopy sometimes is indicated as a diagnostic procedure to determine a treatment pathway. Therapeutically, arthroscopy is indicated for patients in whom conservative therapy has failed and who want the most minimal surgical procedure available. Arthroscopy usually is used as a temporizing measure until definitive surgical treatment is undertaken. Patients should exhaust nonoperative management regimens before arthroscopy is considered. Review the patient's history and perform a physical examination. Obtain plain radiographs, which help determine the extent of the disease and the presence of any loose bodies or chondrocalcinosis. Arthroscopic treatment of degenerative arthritis of the knee can be further subdivided into lavage, debridement, abrasion, and cartilage replacement. Lavage alone has been proven to provide temporary relief of symptoms in patients with degenerative arthritis. Many physicians feel that lavage alone is not enough. Debridement of loose articular cartilage or loose bodies has been proven to provide relief in up to 74% of patients at 14 months. Intraoperative findings usually consist of isolated medial compartment osteoarthritis. Chondromalacia of the medial femoral condyle and tibial plateau usually is identified. The lateral compartment is spared in the varus-aligned knee. The patellofemoral joint may show signs of chondromalacia and osteophyte formation, but the patient may have no clinical symptoms. Meniscal tears and chondral fractures or flaps may be identified and treated with an arthroscopic technique. It is important to implement early range-of-motion (ROM) exercises and isometric quadriceps strengthening as soon as possible after surgery. As swelling subsides and ROM increases, institute a strengthening program. Stationary cycle and walking programs also may be started soon following arthroscopy. In general, the recovery time from an arthroscopy ranges from 1-3 months. Patients who undergo simple debridements and lavages are on the low end of that range, while those undergoing abrasion can expect longer recovery periods. The main complication experienced with arthroscopy is infection. Some surgeons routinely use perioperative antibiotics, but this has not been proven to be efficacious. This complication is quite rare, with an incidence well below 1%. Up to 74% of patients undergoing arthroscopy with lavage and debridement for treatment of arthritis can achieve good-to-excellent results at 14 months. As time passes, the results begin to deteriorate. If abrasion is added, up to 77% of patients may achieve good-to-excellent results at 2 years. Nevertheless, arthroscopy does not address the biomechanical malalignment in these cases, and with time, the fibrocartilage degenerates and knee symptoms return. Patients should be counseled that joint resurfacing eventually will be required. HTO can correct the varus malalignment of the limb, thereby reducing the stresses passed through the medial compartment of the knee. This restoration of normal limb alignment prevents the further destruction of the medial articular cartilage and further collapse into varus. The goal of HTO in the varus-aligned knee is to correct or even overcorrect the limb into valgus, which serves to redistribute the mechanical forces from the medial compartment. Preoperative evaluation should include taking a thorough history, performing a physical examination, and taking radiographic studies of the involved limb. Physical examination should demonstrate flexion of more than 90°, flexion contracture of less than 15°, competent medial collateral ligament (MCL), and normal or slightly increased weight. Preoperative radiographs should reveal mild-to-moderate osteoarthritis with varus alignment. No signs of arthrosis should be present in the lateral or patellofemoral compartments. Patient selection probably is the most important key to successful outcome. The patient must be appropriately counseled about the risks of the surgery, the length of the rehabilitation period, and the temporary effect of this surgery. Patients should be aware of and willing to accept the fact that they will ultimately require joint resurfacing. In the lateral closing wedge osteotomy, a lateral wedge of bone is resected from the tibia. The angle of resection is planned from the preoperative radiographs and determined intraoperatively with fluoroscopy. The medial cortex or hinge then is left intact, and the osteotomy is fixed. This is the most stable form of osteotomy and has the highest union rate. Problems arise because the limb is shortened and the distance between the tibial tubercle and patella is decreased, thereby shortening the patellar tendon. In the medial opening wedge osteotomy, the wedge to be opened is determined from radiographs, and the procedure is performed under fluoroscopy. Autografts and allografts are generally used to fill the opening wedge. The osteotomy then is fixed. This osteotomy lengthens the leg and moves the tibial tubercle laterally, which may lead to patellofemoral symptoms. The risk of nonunion also is higher in this osteotomy. Fixation must be significant. A dome osteotomy requires a dome cut, which can be challenging. The tibia then can be rotated into the appropriate position and fixed. This is the least stable osteotomy and requires significant fixation. Staple and cast fixation is used quite commonly. The patient and surgeon must understand that multiple cast changes may be necessary and that there may be loss of motion when the knee is removed from the cast. This type of fixation is least challenging when converting to a TKA, because less hardware is used in the knee than with other procedures. Plate and screw fixation has recently become more popular. This method provides rigid fixation and allows for early motion of the knee. Issues arise because the surgical dissection is larger for this fixation. Also, the proximal fragment of the osteotomy must be large enough to accept the screw fixation without fracturing. This procedure uses a significant amount of hardware that must be removed prior to converting to a TKA. See the images below. 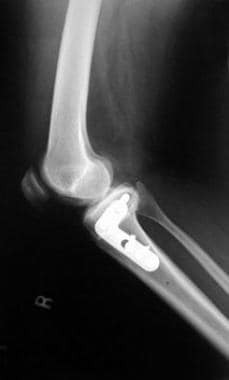 Postoperative lateral radiograph of varus knee that underwent a closing wedge high tibial osteotomy with internal fixation. Lastly, external fixation may be used. This provides an excellent means of fixation and allows for adjustments during the postoperative period. Early motion also is possible. Superficial skin infections at the pin sites are common, however, which can lead to the dreaded complication of a septic knee. Cosmesis also may be an issue for some patients. Articular cartilage usually is not evaluated intraoperatively. Arthroscopy in association with HTO has not been proven to provide any additional benefit and remains quite controversial. Recently, authors have been exploring the option of cartilage replacement with autologous osteoarticular transplant surgery (OATS) or fresh allograft OATS at the time of osteotomy. Although performed at a limited number of centers, this option enables the replacement of damaged articular cartilage at the time of biomechanical realignment. Postoperative management depends upon the type of fixation used. The cast and staple technique requires the patient to be immobilized for 5-8 weeks. Weightbearing is begun gradually, and by 10 weeks after surgery, the osteotomy should be healed and nontender, at which time full weightbearing is resumed. With plate and screw fixation, early mobilization may be undertaken. Immediate range of motion of the knee can be performed. Toe-touch weightbearing can be started within the first 2 weeks postoperatively. Gradual increase in weightbearing can be started at approximately 4 weeks, depending upon the stability of intraoperative fixation. Again, by 10 weeks, the osteotomy is healed and nontender, and full weightbearing is allowed. The same protocol can be followed for the use of external fixation with the knowledge that adjustments may be made to the fixator during the postoperative period. HTO has many possible complications. A thorough discussion should be undertaken with the patient prior to proceeding with an HTO, addressing the postoperative course of immobilization and weightbearing as well as possible complications. This allows the patient to understand the time commitment necessary to provide a good result. It is generally accepted that at least 5° of valgus is necessary for adequate correction and unloading of the medial compartment. Malalignment can result from inaccurate preoperative planning, intraoperative technical errors, and failure of fixation of the osteotomy. Malalignment may be further classified as overcorrection or undercorrection. Malalignment may lead to continued symptoms or acceleration of symptoms in the contralateral compartment. Neurologic injury also has been well reported. Injury can occur to the common peroneal nerve, deep peroneal nerve, superficial peroneal nerve, or posterior tibial nerve. Injury can occur during the time of surgical exposure or postoperatively when the nerve becomes encased in scar tissue. Nerve function generally returns if the injury is a neuropraxia due to stretch, but not if unidentified transection of the nerve occurred at the time of surgery. Vascular injury also has been reported with HTO. The incidence of injury to the popliteal artery and vein is less than 1%; however, this complication can lead to limb loss. Compartment syndrome has been reported. The syndrome occurs in the anterior compartment and can be especially difficult to identify in the immediate postoperative period. Compartment syndrome is caused by swelling in the anterior compartment that cannot be decompressed without surgery. The symptoms of compartment syndrome include pain out of proportion to the surgery and pain with passive range of motion of the muscles in the anterior compartment. In the immediate postoperative period, this determination can be quite difficult. Suspicion of this condition must be high, and surgical decompression should be swift because of the devastating complications associated with a conservatively treated compartment syndrome. Malunion, delayed union, and nonunion have been reported with HTO. Delayed union rates have been reported to be approximately 2.6%, while nonunion has been reported to be 4%. Lateral closing wedge osteotomies provide the largest contact surface of cancellous bone. This, coupled with compression during fixation, leads to the highest rate of union. Deep venous thrombosis (DVT) and pulmonary embolism (PE) have been reported. DVT incidence varies from 1.2-13.5%. The incidence of PE has been reported to range from 1.2-6.1%. Appropriate DVT prophylaxis must be implemented during the postoperative period. The exact method of DVT prophylaxis is highly controversial. The incidence of infection without the use of external fixation has been reported to be 3%. The use of external fixation increases the incidence of infection to 11%. Pin care, as well as prophylactic antibiotics, may be used to decrease this incidence. Postoperative stiffness can occur, especially in patients who are immobilized in a cast for an extended period. Fracture is one of the dreaded complications that can occur intraoperatively. Careful planning and caution in the operating room can prevent many of these fractures. Clinical experience has confirmed the rationale of limb realignment by HTO, but results deteriorate over the long term. Many studies show that the results of HTO are satisfactory at 5-7 years. After this time, results significantly diminish. Many factors contribute to a good result. Surgical technique and patient selection appear to be the most crucial. Younger patients with primary osteoarthritis and intact ligaments and menisci have better results than other patients. Also, postoperative alignment with the appropriate amount of correction has a major influence on the length of time in which good results are maintained. Unicompartmental knee arthroplasty (UKA) is indicated in patients who are older than 60 years and who have sedentary lifestyles, as these patients will place low demands on the implant and thus are at less risk for mechanical failure and implant loosening than active patients. The patient's symptoms should occur predominantly when weightbearing. Few or no patella-related symptoms should be present, although this point remains controversial. The preoperative workup in candidates for UKA includes a thorough history and a complete physical examination. Preoperative radiographs should confirm that the angular deformity is at the level of the joint and is not a result of femoral or tibial bowing. The final determination of whether a patient is a candidate for UKA is made intraoperatively. Inspection of the supposed normal compartments is essential. Peripheral osteophytes on the normal condyle are insignificant, but the presence of degenerative changes is a contraindication to proceeding with UKA. The meniscus in the contralateral compartment also must be examined. It should be normal or only minimally changed. If the possibility of inflammatory arthritis exists, total knee arthroplasty (TKA) should be undertaken. The advantage of UKA over high tibial osteotomy is a lower complication rate for UKA. Most patients can be discharged from the hospital on postoperative day 1. Immediate ROM exercises with full weightbearing are started on day 1. Patients are advanced to full activity as soon as pain tolerance permits. 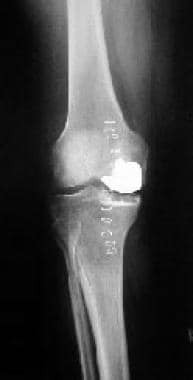 Preoperative radiograph of a medial unicompartmental knee arthroplasty performed in a varus knee. The number of reported complications with UKA has been small. Loosening has been reported, more commonly with the tibial component. However, changes in the design and surgical technique have led to a significant decrease in the incidence of this complication. Osteolysis can occur with gradual cystic changes. Progressive degeneration in the contralateral compartment occurs in approximately 5% of cases. The infection rate is about 1% with appropriate precautions. The literature currently supports the use of UKA in a carefully selected patient population. The survivorship of the prosthesis has been reported in several different studies. One study reports a 93% survivorship at minimum 10-year follow-up. Other authors state that results of UKA are not as predictable as those of TKA. However, with careful patient selection, UKA is a viable option. Because the results of TKA are excellent, some surgeons question whether UKA is ever indicated. Reports have documented that a TKA with good cement technique and well-positioned components has more than a 90% chance of surviving more than 15 years. The results of TKA are predictable and reproducible among orthopedists. Preoperative radiograph of varus-aligned knee with medial compartment osteoarthritis. The preoperative workup in candidates for TKA includes a thorough history and a complete physical examination. Joint line tenderness, crepitus, and altered range of motion (ROM) are identified. Patients may have either a varus or a valgus alignment. Radiographs may reveal unicompartmental or tricompartmental disease. Preoperative radiographs also allow for templating, which may aid the surgical procedure. Intraoperative findings may fall anywhere along a spectrum from unicompartmental to tricompartmental changes. Meniscus tears and anterior cruciate ligament (ACL) deficiency may be encountered. Bony defects may be encountered and corrected with this procedure. The main advantage of TKA is that it can be used to correct most mechanical problems of the knee. By eliminating most of the natural structures in the knee, TKA obviates any concern about potential deterioration of these structures over time. The technique also is very familiar to the orthopedist, and pain almost always is relieved. Postoperatively, ROM exercises are started, and full weightbearing is started the day after surgery. Activity should progress gradually with continuous quadriceps strengthening until the wound is healed and pain has ceased. At this point, full activity is allowed. Complications of TKA include infection, neurovascular injury, extensor mechanism disruption, component failure/wear, osteolysis, and loosening. The accepted infection rate with appropriate precautions has been documented at less than 3%. Advances in surgical technique and instrumentation have reduced the number of malpositioned components leading to early failure. Caution must be exercised when approaching the posterior aspect of the knee in making an osteotomy to avoid laceration or transection of the popliteal artery and vein. TKA performed in a valgus knee places the peroneal nerve at risk for a stretching neuropraxia. Close postoperative examinations must be performed. In general, the quoted lifespan of a TKA is approximately 10 years. Patients with increased activity, including sports, are at a higher risk of polyethylene wear and failure of the implant. Weight also can lead to increased shear stresses to the polyethylene, leading to early wear and possible catastrophic failure. The results of TKA are excellent, which causes some surgeons to question whether UKA is ever indicated. Reports have documented that a TKA with good cement technique and well-positioned components has more than a 90% chance of surviving more than 15 years. The results of TKA are predictable and reproducible among orthopedists. Allograft bone is considered to be somewhat immunogenically privileged, especially when it is cryopreserved. Meniscal tissue and articular cartilage are believed to be immunogenically privileged in that they do not generate an immune response by the host. Fresh osteochondral allografts can be somewhat more immunogenic but are preserved and tested for a couple of weeks prior to implantation. Rejection of the allograft is theoretically possible but occurs in far less than 1% of cases. The cytokine milieu surrounding an allograft plays a role in down-regulating the initial immune response and encourages bony incorporation. The greatest fear with allograft transplantation is disease transmission. Donor selection is critical for control of this problem. All donors are screened for HIV, hepatitis, syphilis, and cytomegalovirus (CMV). Disease transmission was of the utmost concern in the 1980s when screening of the allografts and donors was suboptimal at best. Disease transmission was reported during this time period. Currently, testing is much more stringent and thorough. Many agencies report no incidents of disease transmission in the last 10 years. The reported risk for a recipient contracting HIV infection from a donor who tests negative for HIV is less than 1 in 1 million. Zukor et al reported a 76% success rate for 94 fresh osteochondral allografts with an average of 4.3 years follow-up. The complications experienced with meticulous surgical technique are few. The reasons given for failure are malposition of the graft or malalignment of the limb. Postoperatively, patients are started on passive range of motion (ROM) exercises. The knee is braced. If an osteotomy is performed, patients are restricted to non-weightbearing. No resistive physiotherapy is performed until the brace is removed and the graft has healed, which can take up to 18 months. A number of complications may occur with fresh osteochondral allografts. Mechanical failure is a major concern and can occur with malposition of the allograft or failure to realign the limb. This type of surgical error can lead to a nonunion at the junction of the host bone and allograft. Fracture of the allograft is a great concern. Failure of the fixation often can occur, especially if no healing has occurred at the junction site. Borus T, Thornhill T. Unicompartmental knee arthroplasty. J Am Acad Orthop Surg. 2008 Jan. 16 (1):9-18. [Medline]. Birmingham TB, Kramer JF, Kirkley A, et al. Knee bracing for medial compartment osteoarthritis: effects on proprioception and postural control. Rheumatology (Oxford). 2001 Mar. 40(3):285-9. [Medline]. Dearborn JT, Eakin CL, Skinner HB. Medial compartment arthrosis of the knee. Am J Orthop. 1996 Jan. 25(1):18-26. [Medline]. Grelsamer RP. Unicompartmental osteoarthrosis of the knee. J Bone Joint Surg Am. 1995 Feb. 77(2):278-92. [Medline]. Gross AE, McKee NH, Pritzker KP, Langer F. Reconstruction of skeletal deficits at the knee. A comprehensive osteochondral transplant program. Clin Orthop. 1983 Apr. (174):96-106. [Medline]. Jackson RW. Surgical treatment. Osteotomy and unicompartmental arthroplasty. Am J Knee Surg. 1998 Winter. 11(1):55-7. [Medline]. Kirkley A, Webster-Bogaert S, Litchfield R, et al. The effect of bracing on varus gonarthrosis. J Bone Joint Surg Am. 1999 Apr. 81(4):539-48. [Medline]. Lindenfeld TN, Hewett TE, Andriacchi TP. Joint loading with valgus bracing in patients with varus gonarthrosis. Clin Orthop. 1997 Nov. (344):290-7. [Medline]. Marwin SE, Siegel JA. Unicompartmental Gonarthrosis of the Knee: The Role of Unicompartmental Knee Arthroplasty. Orthopedic Special Edition. 1999. 5(2):57-60. Moseley JB Jr, Wray NP, Kuykendall D, et al. Arthroscopic treatment of osteoarthritis of the knee: a prospective, randomized, placebo-controlled trial. Results of a pilot study. Am J Sports Med. 1996 Jan-Feb. 24(1):28-34. [Medline]. Squire MW, Callaghan JJ, Goetz DD, et al. Unicompartmental knee replacement. A minimum 15 year followup study. Clin Orthop. 1999 Oct. (367):61-72. [Medline]. Bingham CO 3rd, Buckland-Wright JC, Garnero P, Cohen SB, Dougados M, Adami S, et al. Risedronate decreases biochemical markers of cartilage degradation but does not decrease symptoms or slow radiographic progression in patients with medial compartment osteoarthritis of the knee: results of the two-year multinational knee osteoarthritis structural arthritis study. Arthritis Rheum. 2006 Nov. 54(11):3494-507. [Medline]. Kendrick BJ, Rout R, Bottomley NJ, Pandit H, Gill HS, Price AJ, et al. The implications of damage to the lateral femoral condyle on medial unicompartmental knee replacement. J Bone Joint Surg Br. 2010 Mar. 92(3):374-9. [Medline]. Segal NA, Yack HJ, Khole P. Weight, rather than obesity distribution, explains peak external knee adduction moment during level gait. Am J Phys Med Rehabil. 2009 Mar. 88(3):180-8; quiz 189-91, 246. [Medline]. Ogata K, Yasunaga M, Nomiyama H. The effect of wedged insoles on the thrust of osteoarthritic knees. Int Orthop. 1997. 21(5):308-12. [Medline]. Wu LD, Xiong Y, Yan SG, Yang QS. Total knee replacement for posttraumatic degenerative arthritis of the knee. Chin J Traumatol. 2005 Aug. 8(4):195-9. [Medline]. Reimann I. Experimental osteoarthritis of the knee in rabbits induced by alteration of the load-bearing. Acta Orthop Scand. 1973. 44(4):496-504. [Medline]. Vasilevska V, Szeimies U, Stäbler A. Magnetic resonance imaging signs of iliotibial band friction in patients with isolated medial compartment osteoarthritis of the knee. Skeletal Radiol. 2009 Sep. 38(9):871-5. [Medline]. Ehrich EW, Schnitzer TJ, McIlwain H, et al. Effect of specific COX-2 inhibition in osteoarthritis of the knee: a 6 week double blind, placebo controlled pilot study of rofecoxib. Rofecoxib Osteoarthritis Pilot Study Group. J Rheumatol. 1999 Nov. 26(11):2438-47. [Medline]. Adams ME, Atkinson MH, Lussier AJ, et al. The role of viscosupplementation with hylan G-F 20 (Synvisc) in the treatment of osteoarthritis of the knee: a Canadian multicenter trial comparing hylan G-F 20 alone, hylan G-F 20 with non-steroidal anti- inflammatory drugs (NSAIDs) and NSAIDs alone. Osteoarthritis Cartilage. 1995 Dec. 3(4):213-25. [Medline]. Reginster JY, Deroisy R, Rovati LC, et al. Long-term effects of glucosamine sulphate on osteoarthritis progression: a randomised, placebo-controlled clinical trial. Lancet. 2001 Jan 27. 357(9252):251-6. [Medline]. Fransen M, Agaliotis M, Nairn L, Votrubec M, Bridgett L, Su S, et al. Glucosamine and chondroitin for knee osteoarthritis: a double-blind randomised placebo-controlled clinical trial evaluating single and combination regimens. Ann Rheum Dis. 2015 May. 74 (5):851-8. [Medline]. Niemeyer P, Koestler W, Kaehny C, Kreuz PC, Brooks CJ, Strohm PC, et al. Two-year results of open-wedge high tibial osteotomy with fixation by medial plate fixator for medial compartment arthritis with varus malalignment of the knee. Arthroscopy. 2008 Jul. 24(7):796-804. [Medline]. W-Dahl A, Toksvig-Larsen S, Roos EM. Association between knee alignment and knee pain in patients surgically treated for medial knee osteoarthritis by high tibial osteotomy. A one year follow-up study. BMC Musculoskelet Disord. 2009 Dec 8. 10:154. [Medline]. [Full Text]. Bert JM. 10-year survivorship of metal-backed, unicompartmental arthroplasty. J Arthroplasty. 1998 Dec. 13(8):901-5. [Medline]. Kozinn SC, Scott R. Unicondylar knee arthroplasty. J Bone Joint Surg Am. 1989 Jan. 71(1):145-50. [Medline]. Kandel RA, Gross AE, Ganel A, et al. Histopathology of failed osteoarticular shell allografts. Clin Orthop. 1985 Jul-Aug. (197):103-10. [Medline]. Fu FH, Harner CD, Vince KG. Knee surgery. Vol 2. Williams & Wilkins. 1994:1061-255. Emerson RH Jr, Higgins LL. Unicompartmental knee arthroplasty with the oxford prosthesis in patients with medial compartment arthritis. J Bone Joint Surg Am. 2008 Jan. 90(1):118-22. [Medline]. Hopkins AR, New AM, Rodriguez-y-Baena F, Taylor M. Finite element analysis of unicompartmental knee arthroplasty. Med Eng Phys. 2010 Jan. 32(1):14-21. [Medline]. Kirkley A, Birmingham TB, Litchfield RB, et al. A Randomized Trial of Arthroscopic Surgery for Osteoarthritis of the Knee. New England Journal of Medicine. Available at http://www.nejm.org/doi/full/10.1056/NEJMoa0708333. Accessed: September 11, 2008. Marx RG. Arthroscopic Surgery for Osteoarthritis of the Knee?. New England Journal of Medicine. Available at http://www.nejm.org/doi/full/10.1056/NEJMe0804450. Accessed: September 11, 2008. Barclay L, Nghiem HT. Arthroscopic Surgery May Not Be Helpful for Knee Osteoarthritis. Medscape. Available at http://www.medscape.com/viewarticle/580300. Accessed: September 11, 2008. Jackson JP, Waugh W. The technique and complications of upper tibial osteotomy. A review of 226 operations. J Bone Joint Surg Br. 1974 May. 56(2):236-45. [Medline]. Coventry MB. Osteotomy about the knee for degenerative and rheumatoid arthritis. J Bone Joint Surg Am. 1973 Jan. 55(1):23-48. [Medline]. Servien E, Merini A, Lustig S, Neyret P. Lateral uni-compartmental knee replacement: current concepts and future directions. Knee Surg Sports Traumatol Arthrosc. 2013 Jul 6. [Medline]. Lustig S, Scholes CJ, Costa AJ, Coolican MJ, Parker DA. Different changes in slope between the medial and lateral tibial plateau after open-wedge high tibial osteotomy. Knee Surg Sports Traumatol Arthrosc. 2013 Jan. 21(1):32-8. [Medline]. Briem K, Ramsey DK. The role of bracing. Sports Med Arthrosc. 2013 Mar. 21(1):11-7. [Medline]. Ramanoudjame M, Vandenbussche E, Baring T, Solignac N, Augereau B, Gregory T. Fibular nonunion after closed-wedge high tibial osteotomy. Orthop Traumatol Surg Res. 2012 Dec. 98(8):863-7. [Medline]. McNamara I, Birmingham TB, Fowler PJ, Giffin JR. High tibial osteotomy: evolution of research and clinical applications--a Canadian experience. Knee Surg Sports Traumatol Arthrosc. 2013 Jan. 21(1):23-31. [Medline].